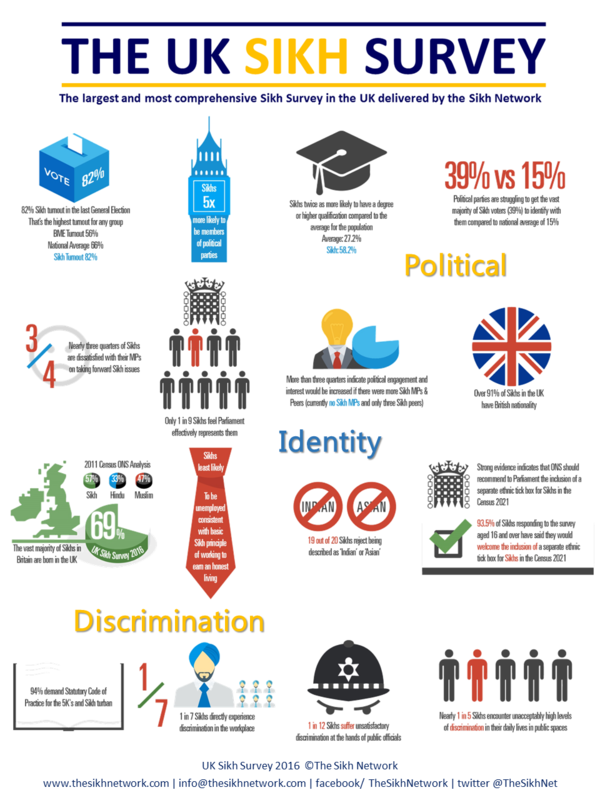 The UK Sikh Survey 2016 is the largest and most comprehensive specific study to date of the views of Sikhs in the UK. 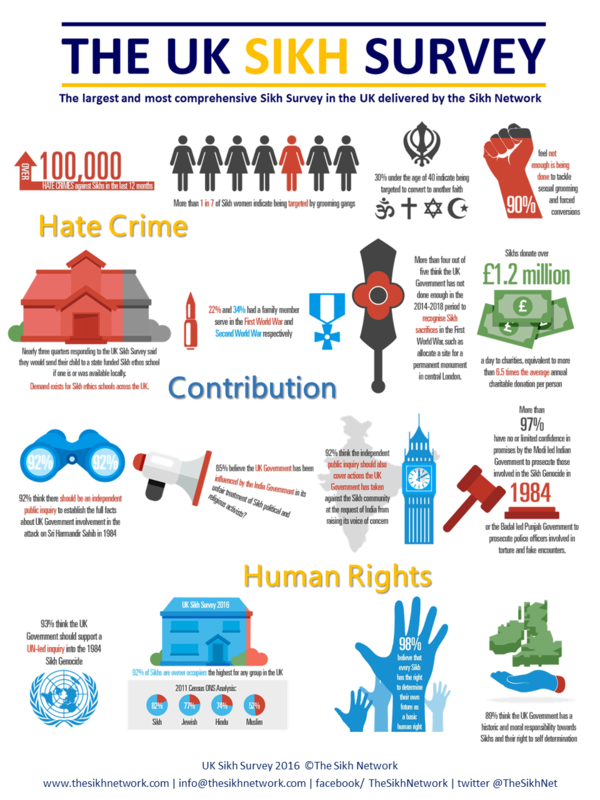 It has been developed and managed by the Sikh Network and was devised as there was a particular need for better statistical evidence on a range of issues that concern the British Sikh community where there was a knowledge gap. To date much of the data that was available on the Sikh community, in respect of contemporary issues and challenges, has been anecdotal. The survey provides invaluable information to decision makers, academics, government bodies, politicians and political parties and will help shape policies which affect all Sikhs in the UK. The Office for National Statistics (ONS), the government’s largest producer of statistics has in particular been interested in the findings and how they could be used. Many of the questions in the UK Sikh Survey 2016 relate directly or indirectly to the Sikh Manifesto which was also developed by the Sikh Network and published in January 2015 before the General Election in May. The Sikh Manifesto was formulated after extensive outreach, amongst the British Sikh community, across the length and breadth of the United Kingdom. The UK Sikh Survey, unlike other smaller surveys of Sikhs, has not simply relied on online responses through self-selection that by definition are limited. The Sikh Network has instead made maximum use of campaigners from dozens of Sikh organisations working in different disciplines across the UK and targeted those groups that are difficult to reach in major cities in all regions of the UK. Face to face interviews where assistance has been provided have been adopted where necessary and hard copies of written questionnaires completed at significant gatherings of Sikhs in the 10 week survey period. This has enabled the Sikh Network to gather the views and opinions of Sikhs on issues that matter to them in order to be able to provide a meaningful thematic overview relating to four key themes. In addition to being an effective communication tool for British Sikhs the UK Sikh Survey Report is also for key policy makers in disseminating new empirical evidence on what it means to be a British Sikh. The aim of the UK Sikh Survey Report 2016 is to provide a way forward for policy think tanks and key policy makers in their acknowledgement of recognising the needs and aspirations of the British Sikh community.